April 13, 2019: Acuna has raised his batting average from .129 to .262 as he has gone 7-for-11 with three homers and a triple. The 21-year-old outfielder has homered in each of the past three games to raise his team-high total to five. He has homered once every 12.75 at-bats while producing MLB’s fourth-highest homer total (24) dating back to last year’s All-Star break. July 15, 2019: Austin Meadows and Ronald Acuña Jr. were named the American League and National League Player of the Week Award winners presented by W.B. Mason. July 2, 2014: Acuna signed with the Braves for $100,000, via scout Polando Petit. Not only did Atlanta skip Acuna over the Dominican Summer League, they promoted him in August 2015 to the Rookie-level Appalachian League, where he continued to hit. Ronald's bonus was not very large. Nearly 200 other international players signed for more during that signing period. The Braves themselves signed six players for larger bonuses. In fact, when Acuna woke up the morning of July 2, 2014, the first day of the signing period, he planned to sign with another team, for even less money. Ronald began playing the game at the age of 3 and has wanted to play professionally for as long as he can remember. Unlike many young Latin American players, he advanced rapidly to the U.S. and had little difficulty adjusting. After the 2016 season, Acuna made up for lost time over the winter in the Australian Baseball League, where he earned all-star honors while hitting .375/.446/.556 in 20 games. In 2016, Baseball America rated Acuna as the 26th-best prospect in the Braves' organization. They moved Ronald all the way up to 6th-best prospect in the offseason before 2017 spring training. And in the winter before 2018 spring camps opened, BA had Acuna as the #1 prospect in the Braves' organization. In 2017, Acuna represented the Braves at the All-Star Futures game. As he has flown through the Braves' farm system, Ronald Acuna has shown he has all the tools to become a Major Leaguer. At the 2017 SiriusXM All-Star Futures Game, the 19-year-old continued to prove just how well-rounded he is with his arm strength in the outfield and solid contact at the plate. In a 7-6 victory for the U.S. team, Acuna showed off his arm from right field with two rockets that clocked in at 95.2 and 96.7 mph, according to Statcast, further backing the idea that he might become a big league outfielder in the near future. "[Those throws are] something that I do all natural," Acuna said through an interpreter. "I don't try to do too much. [My arm strength] is just something natural." 2017 season: Acuna batted .325, tallied 21 home runs, recorded 44 stolen bases, and compiled an .896 OPS over the 612 plate appearances he made for Class A Advanced Florida, Mississippi, and Triple-A Gwinnett combined. The 19-year-old Venezuela native improved his OPS at each level and truly proved himself at Gwinnett, where he hit .344 with a .940 OPS over 54 games. In 2017, Ron was Baseball America's Minor League Player of the Year. Acuna's great season had people talking. In 2017, Acuna was named the Braves Prospect of the Year by MLB Pipeline.com. In 2017, Acuna was invited to play in the AFL Fall Stars Game. Acuna's father, Ron Acuna Sr., and his grandfather, Romualdo Blanco, both played in the Minor Leagues. And several of his other family members play baseball, too. Nov 18, 2017: When the Mesa Solar Sox and Peoria Javelinas take the field in the Arizona Fall League championship game, no player will draw more attention than Atlanta Braves 19-year-old outfield phenom Ronald Acuna. Acuna's rise to prospect stardom was rapid and somewhat unexpected, but perhaps the spotlight should have shone on him a bit sooner. Not only is Acuna a potential five-tool superstar, but he comes from a baseball family -- something that often gets players noticed a bit earlier, especially toward the beginning of their careers. "I have many cousins playing organized baseball," Ron said. "... they [served] as my motivation when I was a kid and saw them play." While his cousins served as motivation, his father and grandfather provided him with good baseball genetics. Blanco, a righthander, posted a 4.58 ERA across six Minor League seasons. Acuna Sr. hit .282 over eight Minor League seasons. "I was told he was a good ballplayer," Acuna said of his grandfather. "He threw hard, 99 to 100 miles per hour, and was on a 40-man roster." Perhaps one of those people telling Acuna about the ballplayers in his family is Luis Salazar, who managed Acuna with the Double-A Mississippi Braves this season and is currently managing him with the Arizona Fall League's Peoria Javelinas. "I played with his grandfather, he was one of the top prospects for the Houston Astros," Salazar said of Blanco, whom he played with in the Venezuelan Baseball League as a member of the La Guaira Sharks in 1974-75. But that's not Salazar's only connection to the Acuna family -- he also managed Acuna Sr. in the winter leagues. Of course, neither Acuna's grandfather or father had the type of career that many expect Acuna to have. Baseball's No. 5 overall prospect slashed .325/.374/.522 with 21 homers and 44 stolen bases over 139 games across three levels this season. He then went on the Arizona Fall League, where he continued to rake, hitting .325 and leading the league with seven homers in 23 games. "I'm very proud of him, like I said earlier, and happy," Acuna Sr. said. "I'm hoping he stays healthy and [does] what everyone says he can do." In 2017, Acuna was the MVP of the Arizona Fall League after he hit .325/.414/.639 and led the league with seven homers in 23 games for the Peoria Javelinas. "Ronald's a special player," Braves manager Brian Snitker said in Spring Training 2018. "There's no doubt about it. You can see that when you watch him. He's just doing what comes natural. He's not trying to be great. He's just doing his thing." MLB debut (April 25, 2018) : Baseball’s top positional prospect, Ronald Acuña Jr., finally made his long-awaited major league debut, after he’d struggled through weeks of service time with the Braves’ Triple-A affiliate. The sole, obvious purpose of this delay was so that the Braves could add an extra year of contract control during the arbitration process. During a back-and-forth game with the cellar-dwelling Reds, Acuña put most of his big-league-ready skills on display. The line on its own looked unremarkable—1-for-5 with a pair of strikeouts—but it’s what came in the margins that flashed his potential. In his first two at-bats, Acuña swung at the first pitches he saw, but both were mammoth outs in close proximity to the wall. Once Acuña landed a poke up the middle for his first big-league hit in the eighth inning, it was a perfect time to showcase his game-changing speed. He clocked in at 30.3 feet/second sprint speed per Statcast, which is in Billy Hamilton territory. The search for the next great international prospect takes scouts to all corners of Latin America -- from the highways in bustling cities like Santo Domingo, Dominican Republic, to winding dirt roads in small fishing villages like La Sabana, Venezuela.The path takes them through places like Mexico, Central America, and backroads across the Caribbean. There, they watch teenage prospects in tryouts, test them in private workouts and, if the scouts are lucky, they get to pit the teens against other top prospects in games. And while each team has their own method and strategy, scouting 15-year-olds and projecting them as Major Leaguers several years in advance is an inexact science. Atlanta outfielder Ronald Acuna Jr., the top prospect in baseball, was about 5-foot-10 and 160 pounds soaking wet when the international scouts came calling in Venezuela. He was athletic and had the family baseball pedigree, but there were doubts about his future. And those reservations helped keep 29 teams from signing him when he became eligible on July 2, 2014. Acuna Jr. is one of the most dynamic players in the game, and he's on track to be the best player in a family full of big leaguers. It's impossible to know how great Acuna will be, but it's already certain that he has the opposing international scouting directors who missed him shaking their heads every time he steps on the field. "I had him on a platter and ready to sign, but I started getting picky," one National League executive said. "He was athletic and he had tools, but I thought his swing was too long. I made a mistake, but that's how it is. You get a couple of looks at a kid and you have to make a decision. I have learned from that experience, though." Acuna Jr.'s size discouraged some scouts, but there are numerous reasons why so many teams could have overlooked him. Maybe he didn't throw, hit or run well during a workout with a team because he was tired or he simply had a bad day. Maybe an area scout didn't "pound the table" hard enough to sign him or the local scouts didn't see him perform well in games. There's also a lot of second-guessing that comes with investing thousands, and sometimes millions, of dollars into 16-year-old prospects. So it's not uncommon for decision-makers to have some doubt, especially when each team has a limited amount of money to spend on the international market. And particularly if a player lacks an obvious "wow" factor. Ronald Acuna Jr.'s big league cousins are Kelvim Escobar, Alcides Escobar, José Escobar, Edwin Escobar and Vicente Campos. Angel Escobar, was the first player from La Sabana to play in the Major Leagues, when he suited up for the Giants in 1988. Another brother, Oscar, played in the Minors with the Blue Jays and Pirates. His brother Miguel Escobar is not only Ronald Acuna Sr.'s cousin, he's also his godfather. November 2018 : Acuna represented MLB in the All-Star Tour in Japan. September 22, 2018 : Acuna's first-inning stolen base made him just the fourth player to record at least 25 homers and 15 stolen bases in his age-20 season or younger. Acuna's favorite player growing up was Miguel Cabrera. When Acuna was younger, he watched Miguel Cabrera play in Venezuela and compared it to "seeing the president." He liked the way Miggy played with ease. The two met when they played against one another in Spring Training (2018). Cabrera gave the outfielder a lot of advice -- telling him to stay humble, work hard and listen to those around him. October 2018: Acuña Jr. was voted Sporting News' 2018 NL Rookie of the Year, as selected by a panel of 192 NL players. SN has given out Rookie of the Year awards since 1946. October 30, 2018: Acuna was named Baseball Digest's National League Rookie of the Year. Nov. 12, 2018: Ronald Acuna Jr. of the Atlanta Braves won the Jackie Robinson NL Rookie of the Year Award, beating out Juan Soto of the Washington Nationals and Walker Buehler of the Los Angeles Dodgers. Acuna, 20, slashed .293/.366/.552 in 111 games (487 plate appearances), with 26 home runs, 64 RBI, a 144 OPS+, .388 wOBA, and 143 wRC+ for the NL East champion Braves.The 20-year-old Soto hit .292/.406/.517 with 22 homers, 70 RBI, a .392 wOBA, 146 wRC+, and 142 OPS+ in 116 games for the Nats. Jan. 28, 2019: As the 2018 season drew to a close, teams jockeyed for spots in the postseason, players made their final cases for end-of-year awards and -- most importantly -- Topps opened fan voting to select which player would have the honor of being the No. 1 baseball card in their 2019 set. April 2, 2019: Ronald announced his eight-year, $100 million contract extension, which includes a $17 million option and $10 million buyout for both the 2027 and '28 seasons. If the young outfielder lives up to expectations, the $124 million he would receive over the next 10 years will be viewed as a team-friendly deal. 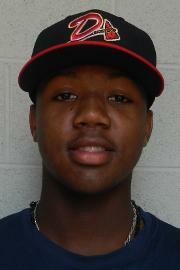 Acuna has a balanced, well-rounded skill set, with a chance for five average to plus tools. He’s a quick-twitch athlete with a strong, projectable build. Ronald has many strengths, and few glaring weaknesses. He is going to be an All-Star multiple times. He's the rare prospect who actually carries future 60 (or better) grades on the 20-80 scale for all five tools. Acuna is a 70 runner with 70 defense who has a 60 arm and 60 hit tool. Many scouts project him to future 70 power. While his body is still developing, he has plus raw power and barrels pitches consistently with his above-average bat speed. Those traits should allow him to hit for average at higher levels. He already uses the whole field. Ronald is advanced at the plate, with good bat control to consistently make hard contact. He has impressive plate discipline—he works the count with an aggressive, but under control, approach. He has sneaky pop with good leverage in his swing. His outstanding bat speed, hammering fastballs to all fields. Ronald has quick hands and an aggressive swing, but has advanced plate discipline. He barrels pitches consistently and shows excellent raw power to the gaps, that should generate extra-base power as his body matures. Acuna projects as a gap-to-gap hitter and profiles as a table setter. In 2017, Acuna's approach improved greatly. And the Braves front office noticed. “It was the approach,” Braves assistant farm director Jonathan Schuerholz said. “You see him laying off breaking balls out of the zone, he’s swinging at fastballs, he’s hitting balls hard when he is getting pitches to hit." One reason Acuna has been able to handle everything thrown at him is he knew what to expect. His father Ron was a Mets outfield prospect in the late 1990s and early 2000s and played eight seasons in the minors, topping out at Double-A. Growing up in Venezuela, Acuna got a crash course from his father on what was truly needed to be a successful ballplayer. Acuna provides most of his value offensively. He is aggressive at the plate and on the base paths, but the righthanded batter displays solid discipline for such a young player. August 13, 2018 : Acuna became just the fourth player in MLB history to lead off both games of a doubleheader with a home run. August 14, 2018: Having routinely displayed an easygoing, youthful innocence throughout these early months of his blossoming career, Ronald understood he was in the midst of something special when he actually felt nervous before his first plate appearance in a 10-6 win over the Marlins at SunTrust Park. "[I was nervous] just because I wasn't sure I would be able to hit another home run like that," Acuna said through an interpreter. Acuna needed just one pitch to amaze himself and the countless others who have been bewildered by what he has proven capable of doing at just age 20. He turned on Trevor Richards' first-pitch fastball, watched it sail over the left-field wall and instantly became the youngest player in Major League history to homer in five consecutive games. "At first, I laughed a lot, and then I got nervous again," Acuna said, when asked for his reaction to the solo shot that also made him the first player since Brady Anderson in 1999 to hit a leadoff homer in three consecutive games. Acuna's nerves didn't prevent him from adding to the splendor of his evening with a three-run, seventh-inning homer off Adam Conley. The no-doubt, opposite-field liner capped his third three-hit performance within a six-game span and provided him his first multi-homer contest. "I'm sitting there thinking, 'Wow, this is something else,'" Braves manager Brian Snitker said. "You're experiencing it and enjoying a young kid with a lot of talent having fun playing baseball." "He's the best leadoff hitter I've ever seen," Ender Inciarte said. "He's the best player I've ever seen. He's just unbelievable. Hopefully, he's going to continue to help us in the long run because we just want to go to the playoffs. He's a big part of where we are right now." September 2, 2018: Ronald has put together a special rookie season, and with another leadoff home run in the Braves' 5-1 win over the Pirates, it became historic. Acuna took Pirates starter Nick Kingham deep to left field on a 1-0 fastball up and in, which gave him seven leadoff home runs this season. That tied him with Marquis Grissom (1997) for the most by a Braves player in a single season. September 5, 2018: Acuna set a franchise record by drilling his eighth leadoff homer of the year. September 9, 2018 : Ronald Acuna Jr. added to his second-half power surge and became just the seventh player to tally 25 homers in a season before turning 21 years old. October 8, 2018 : The 20-year-old's second-inning grand slam gave the Braves an early five-run lead that propelled them to a 6-5 victory against the Dodgers in Game 3 of the National League Division Series, staving off elimination on Sunday night at SunTrust Park. And in so doing, he became the youngest player to hit a grand slam in the postseason, ahead of Hall of Famer Mickey Mantle. 2018: Acuna became the youngest player (age 20) known to have homered in five straight games and seven of eight, finishing the season with 26. Jan 19, 2019: How the Braves construct their lineup will depend on who is acquired or selected to fill their outfield void. But Ronald Acuna Jr. admits his preference is to remain at the top of Atlanta's lineup. "Obviously, I do enjoy batting leadoff, but it's not my decision," Acuna said through an interpreter. "It's up to the coaches and manager to decide whatever is best for the team." Acuna's rise toward capturing the National League Rookie of the Year Award in 2018 began on July 20, when he moved to the leadoff spot and proceeded to hit .322 with 19 homers and a 1.028 OPS over the 68 games that followed. The 20-year-old phenom's second-half success served as one of the primary reasons Atlanta won the NL East. April 15, 2019: Ronald Acuña Jr. was named the National League Player of the Week Award winner presented by W.B. Mason, Major League Baseball announced. Acuna had a .545 batting average, going 12-for-22 on the week as well for the Braves. He hit three homers and knocked in nine runs as the Braves went 4-2 over the course of the week. Ronald has the speed to cover a lot of center field, rating a plus defender (60 to 65 grade). Acuna has a 70 arm. "Don't run on Ronald!" can be heard before a team takes on the Braves. "Don't run on Acuna!" and that's because he has been clocked as high as 96.7 mph—from an outfielder, not a pitcher! Acuna is very fast, earning 70 grades on his speed tool. May 12-August 22, 2016: Acuna was on the DL with a broken thumb. He ended up having surgery for it and was healthy for only 40 games that year. May 28-June 28, 2018: Acuna was on the DL with left knee contusion and mild ACL sprain.